Actually, one may wonder whether city managers and economic development board chairs could have afforded not to run for such an offer. (We know that a few decided in the very end not to apply, see our entry here). Obviously, the temptation and excitement about this opportunity – 50,000 jobs created, an overall investment of about US$5bn – and hence the desire to apply was much greater than any doubts and reservations might have been, which might have prevented public officials from bidding. No, almost everybody in charge of urban and regional policy and practice had to run for this: That is at least what the competition (and the way it was publicly framed and perceived) looked like. Whether the offer will indeed be a great chance for the selected cities, or whether it will make them even more overcrowded and divided, remains to be seen. In terms of the definitive location choice, the pros and cons of agglomeration were obviously carefully weighed and balanced – actually more carefully than one would have expected in the beginning. Even Amazon officials might have learned from the well disputed prospect of placing 50,000 employees at one single locale – a promise that quickly turned into a threat for many. 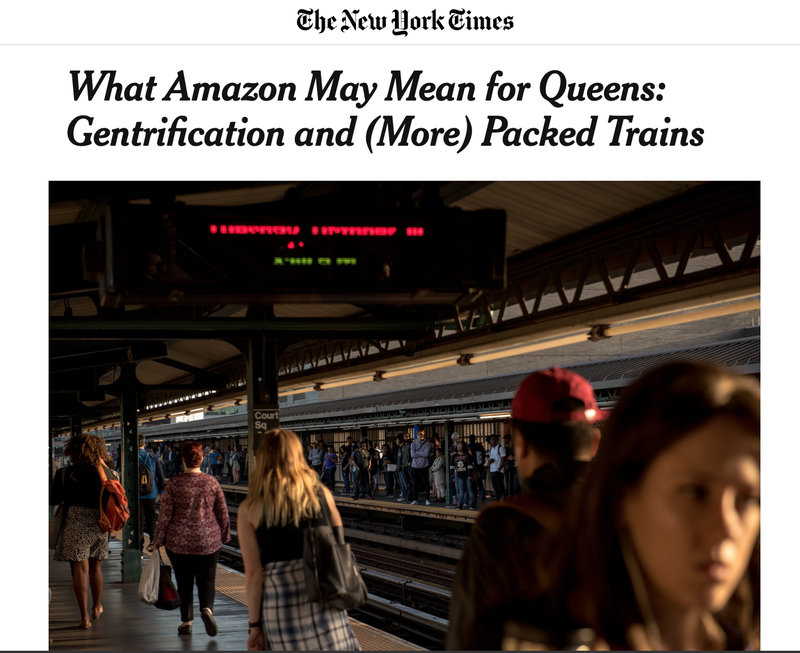 Some commentators were also pointing at an earlier blogpost by Joe Cortright who expected nothing but a split of the big HQ into at least a few locations; otherwise cities wouldn’t be able to handle that injection of money, buildings, people and their demand. How is it possible to suddenly provide housing for that sheer number of people? How is it possible to add so many daily trips to transport networks that are already working far beyond limits? 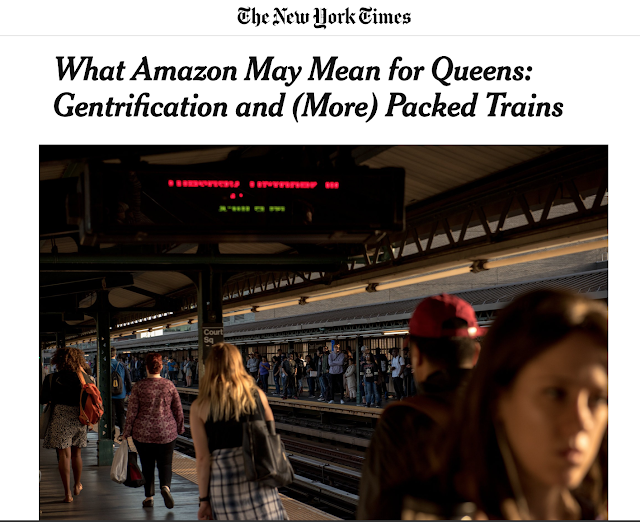 Seriously, why not take into these issues into account and dedicate a subway line for the exclusive use of Amazon staff, as The Onion has already suggested (thus evoking the Google-bus controversy from the SF Bay Area …)? Now the cake is divided into two, with each city getting 25,000 jobs each, plus another 5,000 for a tech-fulfilment basis in Nashville, Tennessee. We will have to wait and see how this sort of massive place-making will work. Soon after the decision went public, Crystal City seemed already re-branded into the somehow superficial “National Landing”. There will be more of this coming up in the near future. Inserting a global player’s headquarters into actually existing urban life-worlds (i.e. places that already tend to suffer from having too much of everything…) will become a rather exciting experiment for urban studies. Current and future student generations are well advised to keep an eye on the framing, implementation and contestation of all of this. Last but not least, if the planet is going to get desperate with the never-ending race to the bottom for more, then Bezos will bring those who can afford outer space, where ‘Blue Origin’ will offer them a safe, extraterrestrial haven. Cynical? No, it’s just about customer dedication, technology and the modern world, stupid. -1- Those who are interested in learning more about this case: Planetizen.com provides an excellent overview on the subject matter and various responses from cities, stakeholders, observers. -2- Wondering to what extent the new, tech- and data-trading big corporation, its locational imprint and the associated ramifications for people and place(s) have already been covered by textbooks. They actually deserve the same treatment as it was the case with the industrial corporation (see e.g. Phillip O’Neill: The Industrial Corporation and Capitalism’s Time –Space Fix. In: Trevor J. Barnes, Jamie Peck, Eric Sheppard (eds.) The Wiley-Blackwell Companion to Economic Geography, pp. 74-90. Chichester: Wiley-Blackwell). -3- See my book chapter on “The logics and politics of circulation. Exploring the urban and non-urban spaces of Amazon.com”, in K. Ward, A. E. Jonas, B. Miller, D. Wilson (eds.) Routledge Handbook of Spaces of Urban Politics, pp. 404-415. Abingdon/New York: Routledge (2018).